The awesome crochet net design at the neckline of this dress gives it an intricate touch. The Net Work A-Line Dress is fully lined and made of chiffon. It has a plunging sweetheart neckline, lightly padded bust, and a banded empire waist. The flowy cut of this skirt makes it girly and romantic. The best part of this dress has to be the sheer crochet fabric at the neckline and top back that reminds us of a net. A hidden back zipper completes this look. The Net Work A-Line Dress is a party perfect look that pairs well with wedges, pumps, or strappy heels. Details: Fully lined except at neckline and top back. Hidden back zipper. Lightly padded bust. 100% polyester. Hand wash cold with like colors. Do not bleach. Low iron. Small measurements: Length from top of shoulder to hemline: 33". Bust: 33". You have added Net Work A-Line Dress in Teal into Wishlist. 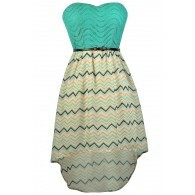 You have added Net Work A-Line Dress in Teal for Stock Notification. You have set Net Work A-Line Dress in Teal as a loved product. You have removed Net Work A-Line Dress in Teal as a loved product.